The AWA and IR Sections. All these abbreviations hit you when you start preparing for the GMAT. What do these stand for? AWA stands for the Analytical Writing Assessment. 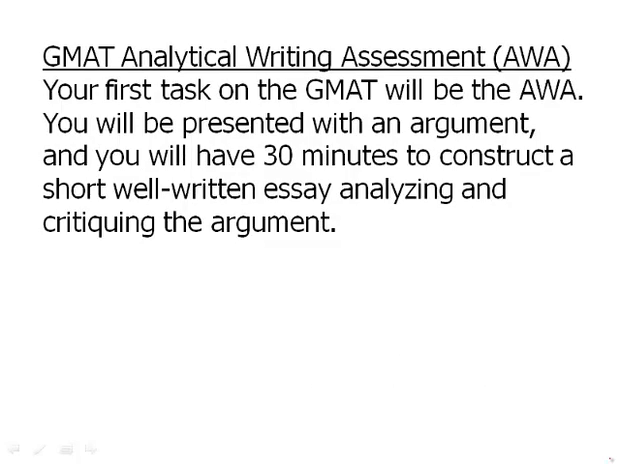 In other words, that's the essay that you write for the GMAT. And IR stands for the Integrated Reasoning section. These are respectively, the first and second sections on the GMAT, 30 minutes each. So when you sit down for your GMAT, you'll write an essay for half an hour, then you'll have a half an hour Integrated Reading section. Then after that you have a math section and a verbal section. The Analytical Writing Assessment. Your first task on the GMAT will be the AWA. You will be presented with an argument, and you will have 30 minutes to construct a short well written essay analyzing and critiquing the argument. Often the argument is a highly flawed argument and it's very easy to point out flaws in the argument. I'll point out also, the official guide, the GMAT official guide, has all possible prompt arguments. Any possible prompt they would give you on the test is already printed in the official guide, so theoretically, you could read every single one of them and have something in mind. The Integrated Reasoning section immediately after your AWA essay, you will have a 30 minute IR section. The formats of the questions on the IR section are unique to the GMAT. They combine mathematical thinking and verbal thinking. Graphs and data interpretation are prominent. The basic idea of IR is, you see, think about when you're in the business world. The business world doesn't have a separate math section and verbal section. If you're sitting at a business meeting, you could get a chart one minute with all kinds of mathematical information, and then a verbal argument the next minute and even have them related. In other words, math and verbal are integrated in the real world. So the GMAT wanted to create a question in which math and verbal could be integrated, and that is the basic idea of the Integrated Reasoning section. There are 12 questions, or more accurately 12 screens, most with multiple tasks. Some of the question formats are unique to the GMAT Integrated Reasoning section. So I highly recommend getting familiar with the different formats of those questions. You can find out much more about this in our set of video lessons about the IR section.